50 Years of Progress Halves Smoking Rate, But Can We Reach Zero? Smoking rates cut in half. Eight million lives saved. More than 800,000 fewer lung cancer deaths. Fifty years after the U.S. Surgeon General first warned about the dangers of smoking, the benefits of quitting have never been clearer. Yet 18 percent of the population still smokes. Nearly 2,000 teenagers take up the habit every day and tobacco companies advertise candy-flavored tobacco products with impunity. Is it possible this is the best the United States will ever do? Health experts are convinced it isn’t — and they point to maps that rank states and regions by smoking status as proof. A look at a county-by-county breakdown of who smokes and where makes it clear that there are opportunities to get smoking rates way down, they say. Kentucky has the most smokers — more than 28 percent of the population smokes there, compared to just 11 percent in Utah, which has the lowest rates, and double the 14 percent in California. And when you overlay those smoking maps with details of rates of heart disease, stroke and cancer, it’s equally clear that there are still plenty of lives to be saved by trying. Also, raising the legal age to buy tobacco products to 21 would go a long way to stopping kids from ever getting addicted in the first place, the Heart Association, American Lung Association, American Cancer Society, Campaign for Tobacco-Free Kids and other groups agree. “We do it with booze yet we don’t do it with cigarettes, when cigarettes kill about 10 times more people than alcohol does,” says Dr. Michael Fiore of the University of Wisconsin’s Center for Tobacco Research and Intervention. Smoking is often just another marker for social and economic disparities, Fiore adds. “Fewer than 10 percent of college graduates smoke,” Fiore points out. But 35 percent of people who never graduated from high school do. It was Jan. 11, 1964 when then-Surgeon General Dr. Luther Terry held a news conference to announce that smoking causes cancer and probably heart disease, too. It was a time when close to half of Americans smoked — including Terry himself — and it set off a 50-year battle between regulators and the tobacco industry. Since then, science has proven beyond any doubt that smoking causes most cases of lung cancer, most heart disease and lung disease as well as stroke and a range of cancers from breast to bladder. Researchers have proven that nicotine is one of the most addictive substances known, and that tobacco companies deliberately manipulate nicotine levels in their products to get people hooked on the first cigarette and keep them hooked for life. In a study published this week in the Journal of the American Medical Association, Theodore Holford of the Yale School of Public Health and colleagues estimated that 17.7 million people died between 1964 and 2012 because of smoking. But they also calculated that tobacco control measures saved 8 million lives. And the average American lives two years longer than they otherwise would have, they said. Yet smoking still kills 1 in 5 Americans, or 440,000 people a year, the Centers for Disease Control and Prevention says. That includes more than 49,000 people who die from the effects of secondhand smoke. When tobacco companies lost the fight to shed doubt on the health effects of smoking, they re-framed the issue as one of personal choice. When schools, cities and employers completely banned smoking on their premises, companies advertised cigarettes as stress-relievers and subtly encouraged smokers to feel like they were somehow edgy rebels instead of tobacco addicts. But measures aimed at smokers worked, and smoking rates have plummeted from 42 percent of the population in 1965 to 18 percent today. Congress and state legislatures have declined to make smoking illegal, but health experts say there are ways to get smoking rates even lower despite the law. One way is to stop people from smoking in the first place, says Dr. James Perrin, president of the American Academy of Pediatrics. 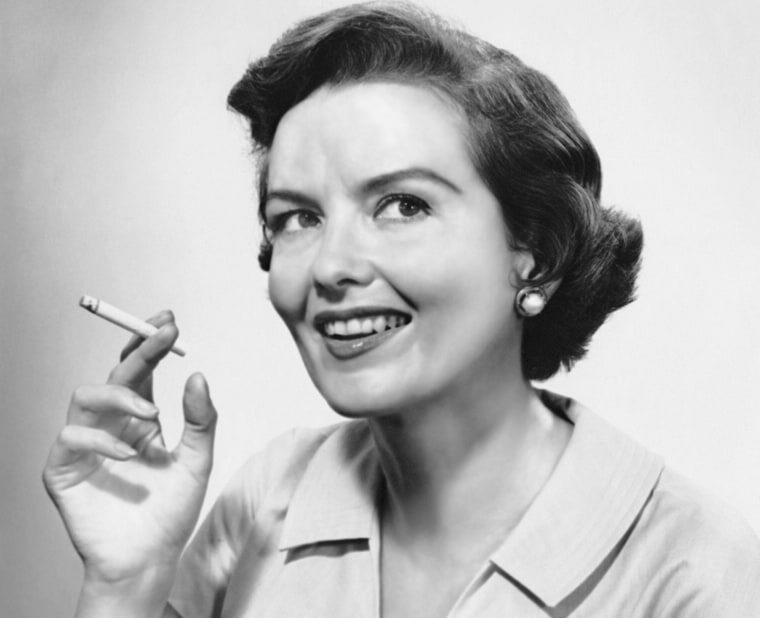 “Eighty-eight percent or more of lifetime smokers start before they turn age 18,” he told NBC News. The adolescent brain is particularly susceptible to the addicting effects of nicotine, and just raising the legal age to buy tobacco to 21 would help get kids past the most vulnerable point, he says. Perrin joins other health experts in urging the Food and Drug Administration to take a firmer hand. “Four years ago, the US stopped sales of candy-flavored cigarettes because they are particularly appealing to children,” Perrin said. Yet little cigars flavored like cotton candy, grape and even gummy bears remain on the market. Such products are not aimed at 40-year-olds, Perrin maintains. States add their own taxes, and Kentucky, the state with the highest smoking rates, adds just 60 cents a pack, while New York adds $4.35 a pack and Massachusetts $3.50. Studies show that the people most likely to smoke are also the most sensitive to price. Experts also argue that states aren’t spending these tax revenues properly in helping people to stop smoking. They’re also not using a big pot of money called the Tobacco Master Settlement Agreement, which was a giant lawsuit settled in 1998 between the attorneys general of 46 states and the four biggest tobacco companies. It provides $206 billion over 25 years — that’s more than $175 million a year per state, or more than $8 billion a year for all the states. Yet states spent just $640 million on tobacco control efforts in 2010. Tobacco companies have fought and lobbied against every measure. But anti-tobacco activists marked a victory on Friday. Tobacco companies and the federal government reached an agreement on a series of “corrective statements” the companies must publish. It comes from a 2006 ruling in which Washington, D.C., federal district judge Gladys Kessler ruled that the cigarette companies conspired for decades to conceal the dangers of smoking. Under the agreement with the Justice Department , each of the companies must publish full-page ads in the Sunday editions of 35 newspapers and on the newspapers' websites, as well as air prime-time TV spots on CBS, ABC or NBC five times per week for a year. They’ve been fighting over the wording, says Vince Willmore of the Campaign for Tobacco-Free Kids. “The companies have appealed every step of the way,” he said. These ads must say, for instance: "Smoking kills, on average, 1,200 Americans. Every day." "Philip Morris USA, R.J. Reynolds Tobacco, Lorillard, and Altria intentionally designed cigarettes to make them more addictive." "When you smoke, the nicotine actually changes the brain — that's why quitting is so hard." The companies also must publish the statements on their own websites and affix them to a certain number of cigarette packs three times per year for two years.